This is one of the more popular books this fall and although it's taken me awhile to get to it, I finally did. Now I know what all the fuss is about--and I have to agree; it's worth it. 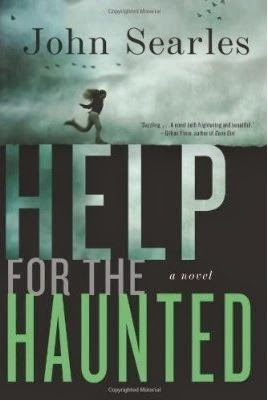 I love a good thriller and John Searles wastes no time in his latest novel, Help for the Haunted, setting the scene and pulling the reader right into the book. The story is narrated by teen-aged Sylvie, a bright girl who is basically good through and through. She was her parents' obedient daughter, the one who they could trust to do as she was told, unlike her older sister Rose who seemed to rebel at every turn. I grew to really like Sylvie and care for her. Her parents were brutally murdered, and she is lucky to be alive. As she recounts the tale of her parents's lives and their murder, we get a strong sense of who her family was, what they meant to her, and just how deep their secrets went. I appreciated Sylvie's honesty and naivety. It gave the narration a more authentic feel. Sylvie had an inner strength that was undeniable. My heart broke for her at every turn while at the same while I admired how resilient she was, and how resourceful. When I first began reading Help for the Haunted, I wasn't sure what kind of novel I was getting myself into. Was it a ghost story or more of a crime fiction novel? Was it a good mix of both? I liked how the author worked the paranormal into the mystery, really leaving it up to the reader what to believe. Much of what happens can be explained away, and yet there is just enough to make you wonder on the other hand. It really can go either way, depending on the reader. The author strikes a good balance between plot and characterization. The characters are all fully developed, and the plot is well set with plenty of twists to keep the reader guessing, including this reader which can be hard to do. I had such fun reading this atmospheric novel, and had a hard time putting it down. I hope to go back and read the author's back list and look forward to seeing what he has to offer in the future. You can learn more about John Searles and his books on the author's Facebook Page. I've not seen one negative thing about this book. I'm just annoyed that I didn't read it during RIP! (Not that I signed up for RIP but I could have.) I've added it to my list on Goodreads! Sandy - I'm sure your reading card was full enough. :-) I hope you do get a chance to read it, Sandy. I like stories that have a good mix of genres and this sounds excellent. Where have I been that I hadn't heard of this?! Great review and it's going on my list! Iliana - I wasn't sure what I would be getting going into the novel, but the author did a good job of keeping me guessing. It's been a while since I last read a good thriller. This one is completely new to me but I like the way it made you feel about it. "[...] there is just enough to make you wonder on the other hand." I like that! Alice - I thought this one was very well written, not to mention tense. If you are looking for a good thriller, this is definitely one to think about reading. This sounds like a great fall read. I have a feeling I'll love it! Kathy - I think you would like it! Sounds like the kind of read I'd enjoy curling up with on a cold winters night. Thanks for the recommendation. Tracy - Maybe just make sure the doors are locked first! I had not heard of this book either. Sounds very well written and exciting. Carla - I thought so. I was really impressed with it. Man, I wish my library had this one! I'm glad you enjoyed it . It's fun when a book lives up to its hype, isn't it? Susan - It's an excellent time to shop for your Christmas box! If you do read this one, I hope you will like it. I can see it being something you'd like. I'm looking forward to reading this one, despite the paranormal aspect. I hope it's not too much for me. Joy - I am really curious to know what you think of this one.